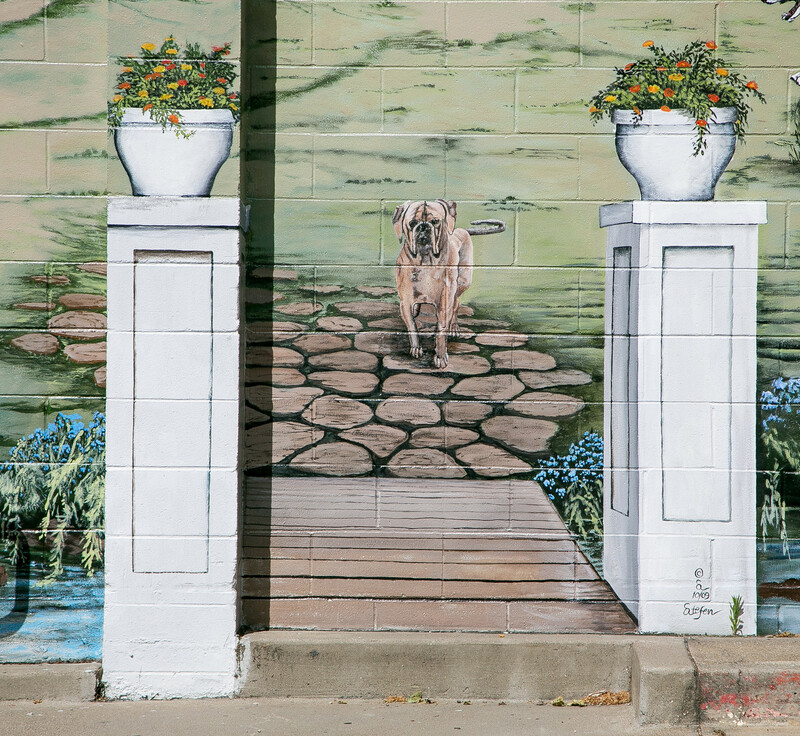 Stefen, who has been Stefen since 1974, has been painting murals since 1974. 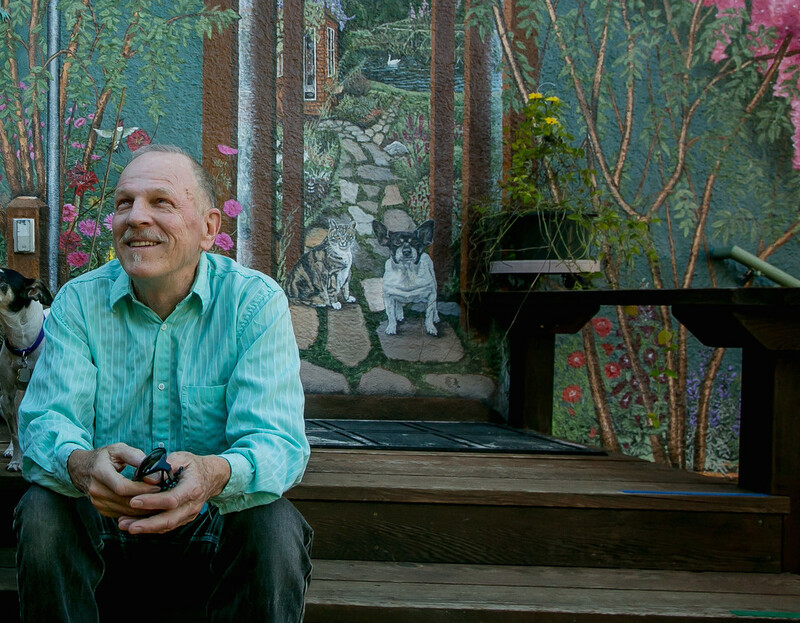 He is s prolific muralist and he is the founder of the New Berkeley Mural Movement. That Movement doesn’t exist as a formal entity and there is no such thing as a Founder of a notional Movement that doesn’t actually exist, but conceptually it is an intellectually honest assertion. 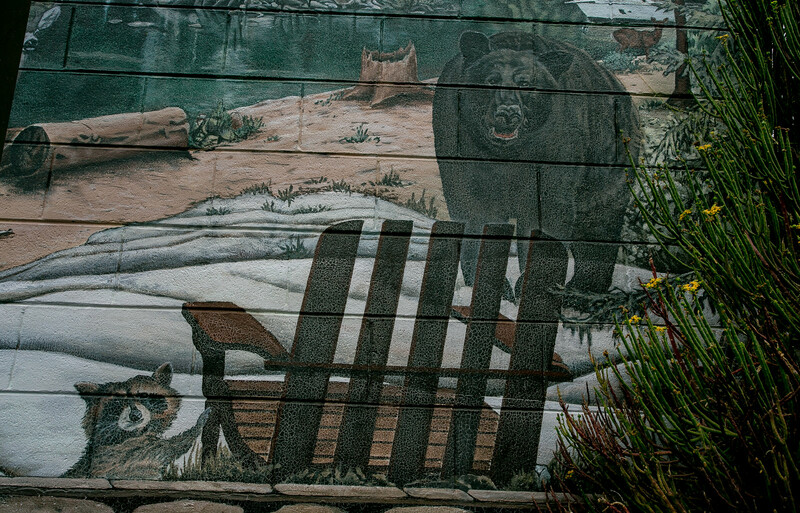 Berkeley was not without murals before Stefen, but they were conventional, mainstream, highbrow art. 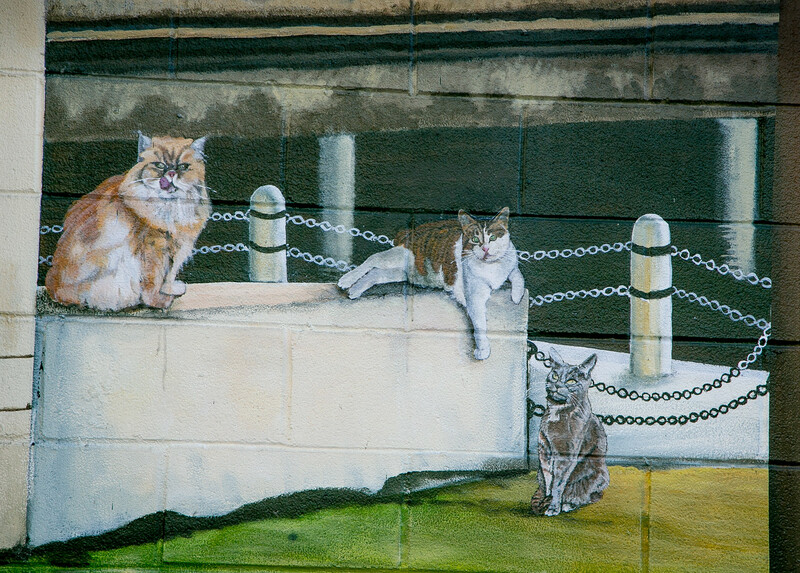 We had no real street murals. 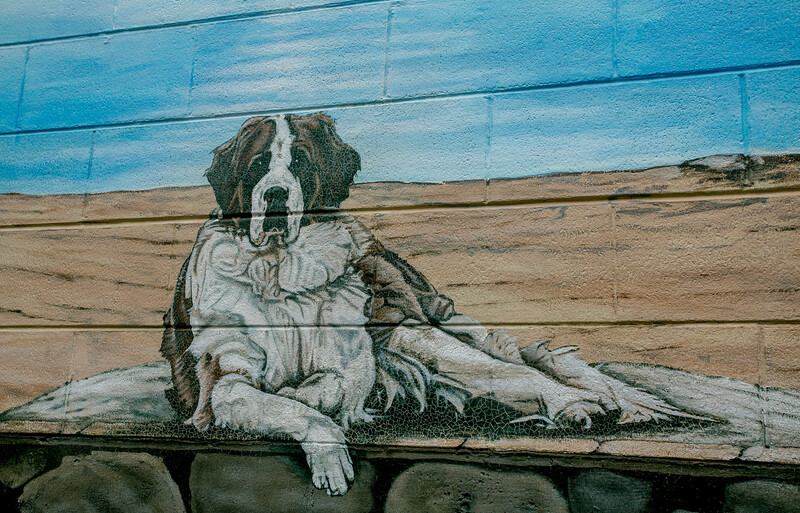 At least – I have found no street murals in Berkeley before Stefen’s Dutchboy. I might be wrong, but I’ve looked and haven’t found. And then came Stefen. He who in 1974 became Stefen grew up in the high desert of Nevada. 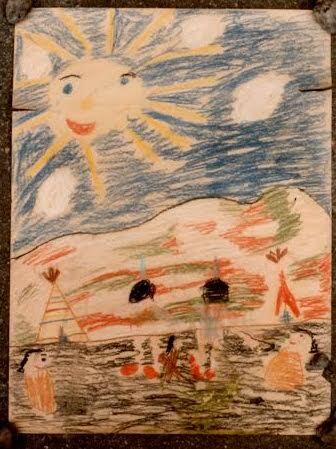 He made art from a young age. He made this painting in first grade, and it won first prize in a statewide competition. He studied art at the University of Oregon. He then went to Paris, where he lived for three years. Nevada to Oregon to Paris to – Berkeley. His paintings were getting bigger. 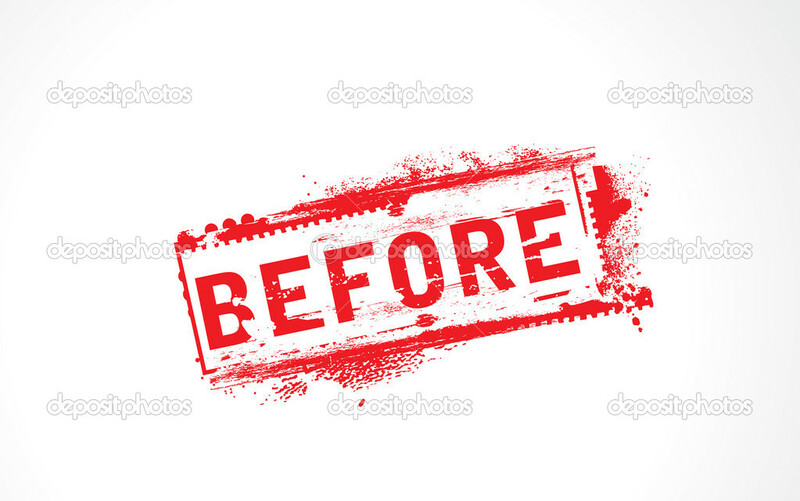 A change was gonna come. 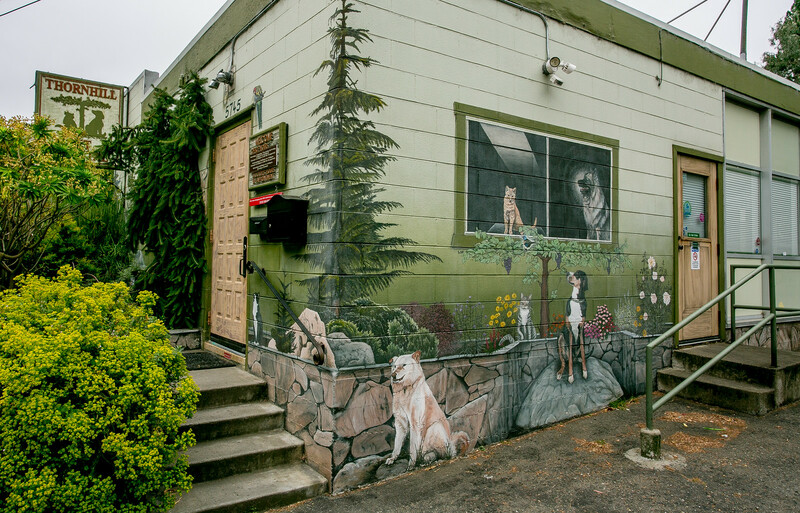 Stefen’s first mural in Berkeley was a megamural. 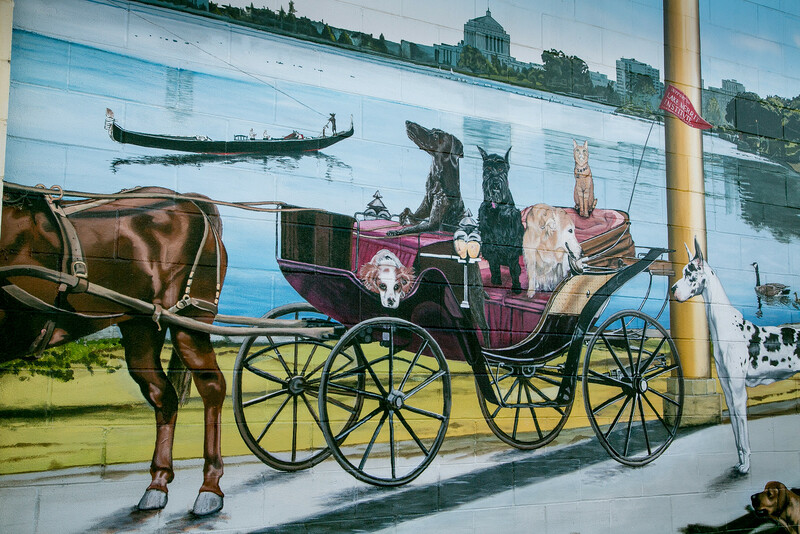 Talk with anyone who was here then and they sigh with affection when they remember the Dutch Boy mural. 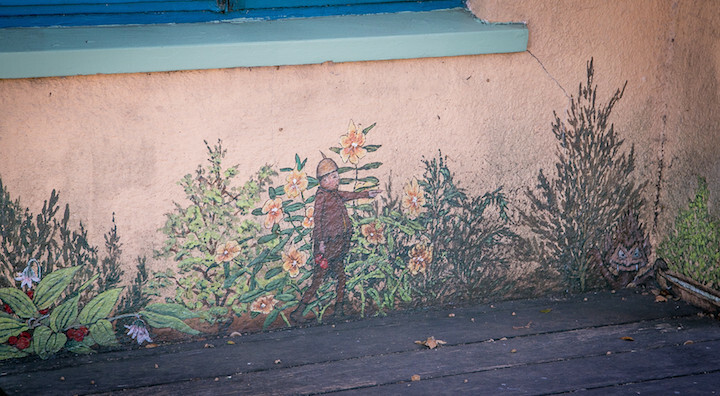 From 1974 until 1977, this mural was on the long wall (25′ by 90′) at the southeast corner of Milvia and University, then a Dutch Boy Paint store, now Au Coquelet. The design and execution were by Stefen. Jeff Dayton painted some of the solid-color areas. Gary Graham painted the Dutch Boy figure, a portrait of Stefen. 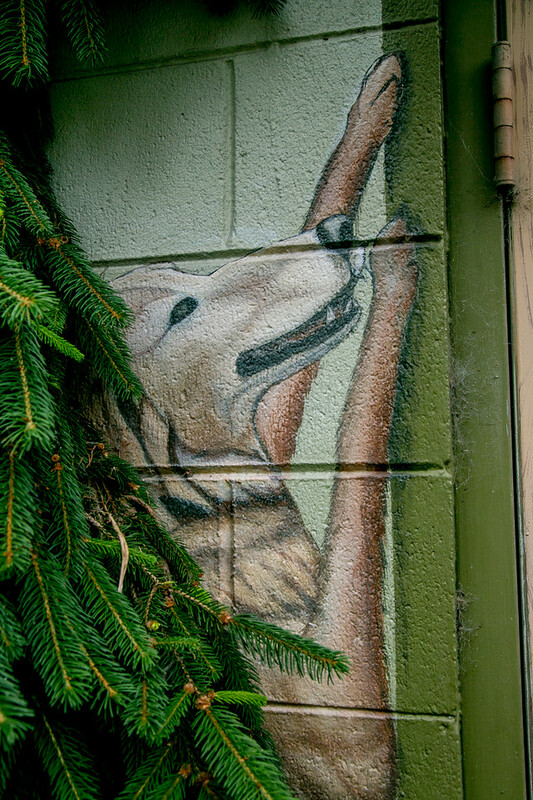 It was while painting this mural that Stefen took the name Stefen. 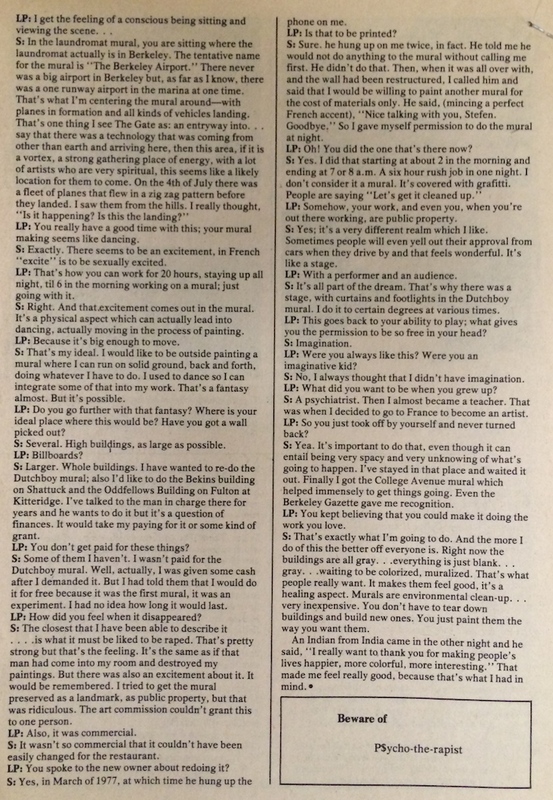 A friend from Paris (something about Pink Floyd’s “Dark Side of the Moon” and a trip to Crete) wrote him, urging him to paint under the name Stefen from then on because “Stefen” came to him in a dream. Stefen accepted this suggestion. 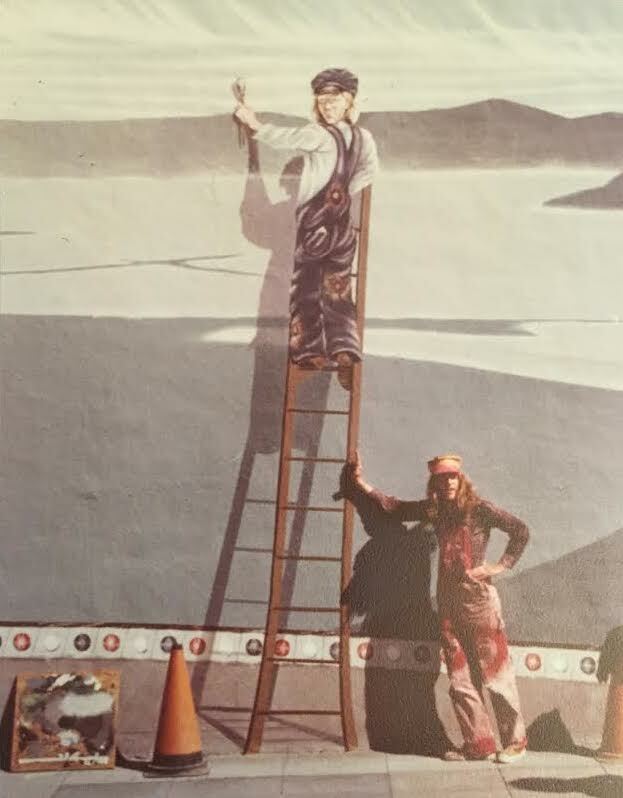 The mural was completed on March 12, 1974 – Stefen’s 27th birthday. 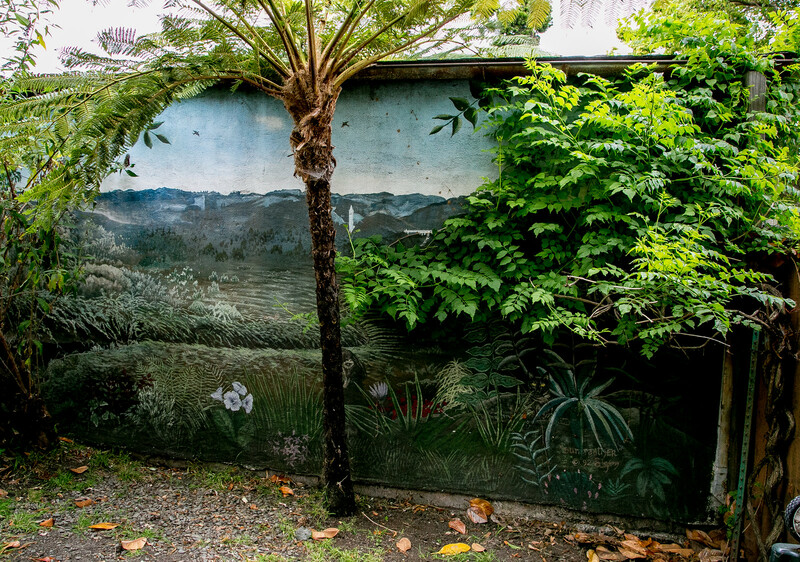 It was up for three years when the property changed hands and a restauranteur (Au Coquelet’s original owner Jean-Marie Lagourgue began taking actions that suggested that the mural was in peril. 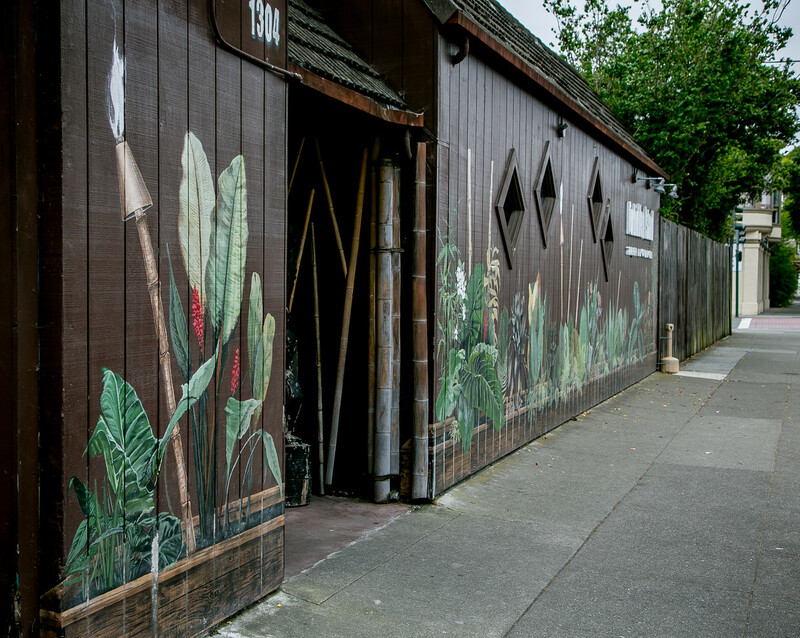 With the Dutch Boy, Berkeley entered a new era of street murals. 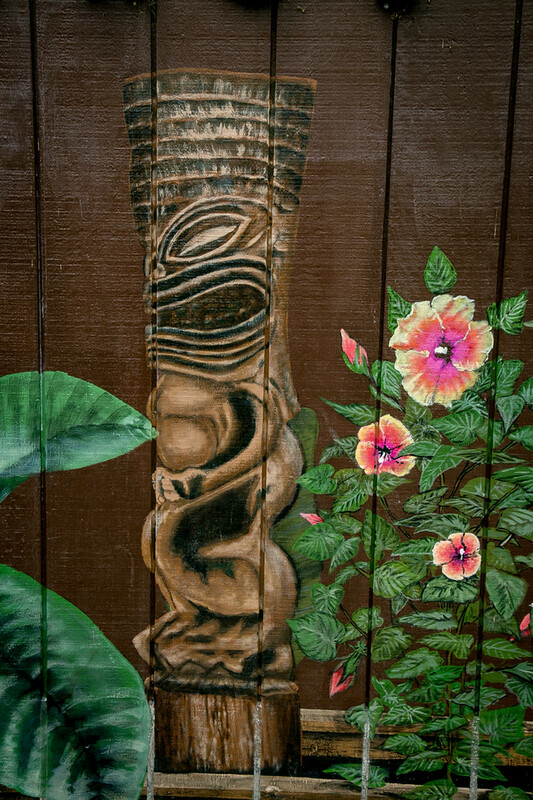 Osha Newman, Lou Silva, Irene Perez, Eduardo Pineda, and others took brush to wall and murals flourished. Many of them are featured in another Quirky Berkeley post. 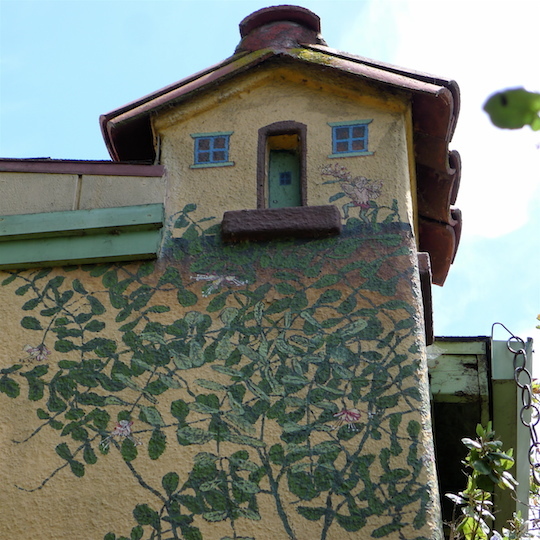 Featured here are photos of existing Stefen Berkeley murals. And a few outside Berkeley. To start, I found and show five visible to the public in Berkeley. The first Stefen mural that I saw is at 1110 Chaucer. 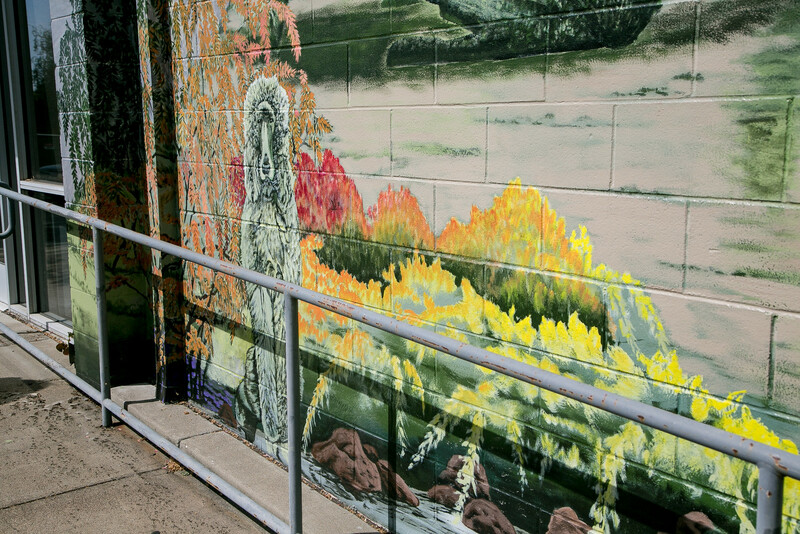 The mural depicts little people and California native plants. 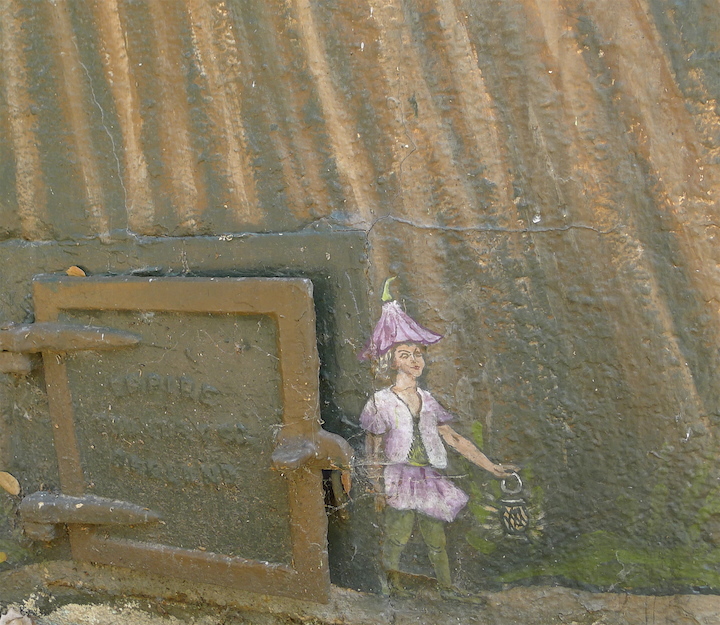 Little people as in fairies and brownies and others who are found in the folklore of many cultures. 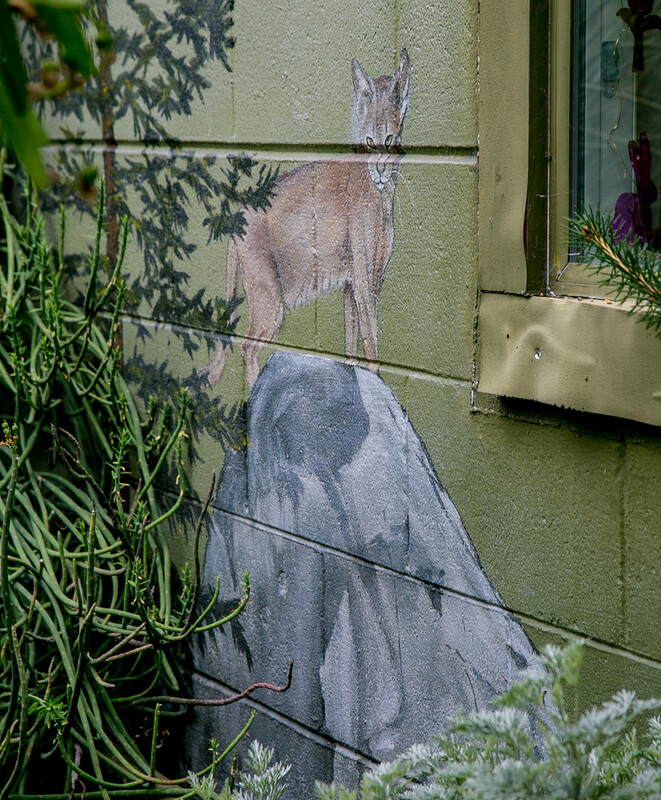 It was a collaboration between Stefen and Riley, who owns the house and is all about native plants and creek restoration. The second is at Cha-Am. 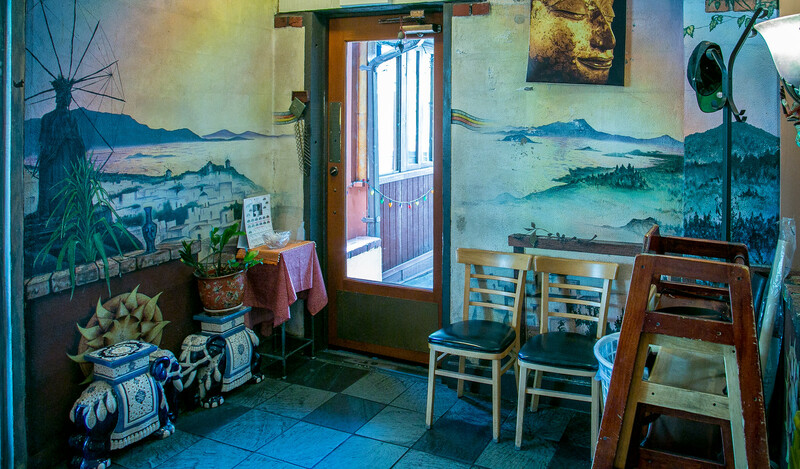 It is a Thai restaurant near the northeast corner of Cedar and Shattuck. It is next to Dara, the Thai/Lao restaurant that is our home away from home. 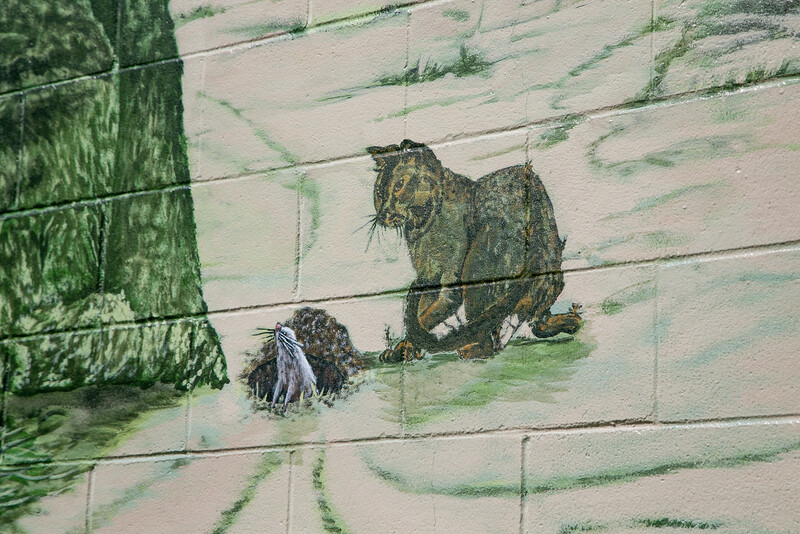 Except the Stefen mural is at Cha-Am. On Allston below Sacramento. If you peek through the big gate you can see it, facing west on a garage door. 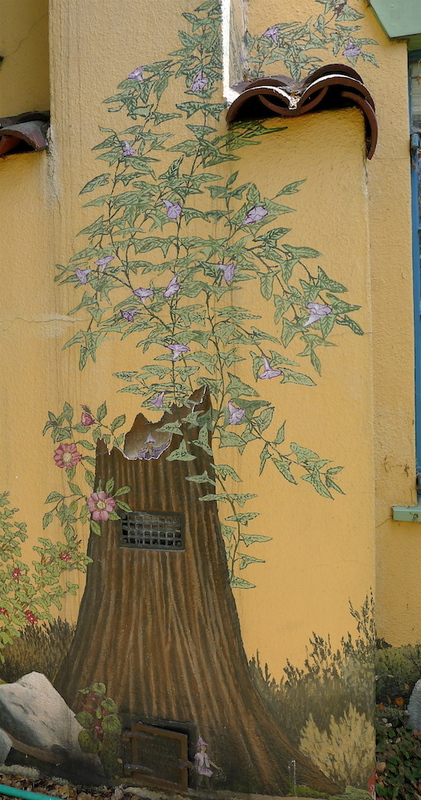 Stefen painted it in 1992. This one is tough to see, but you can. It is over Codornices Creek on Kains Avenue, north of Gilman, between Harrison and Darmouth. John Storey took this photo climbing up on a fence off of San Pablo. Not recommended! But – you can see it sorta kinda -ish from Kains. 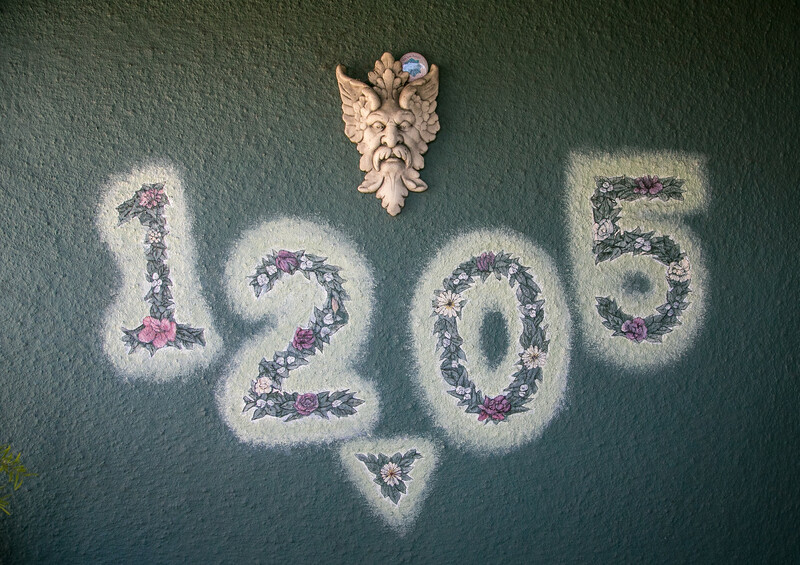 One additional little bit of Stefen art that can be seen from the street is this house number. It is the home of Louise Berman. 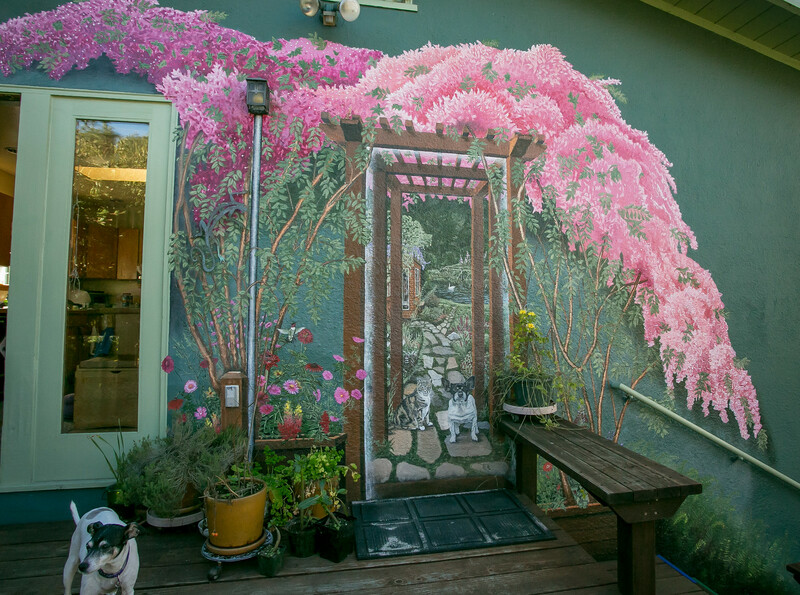 Stefen rented a room here and while living here painted a stunning mural on the wall of the house facing the garden. It stars her dog at the time, Buster. 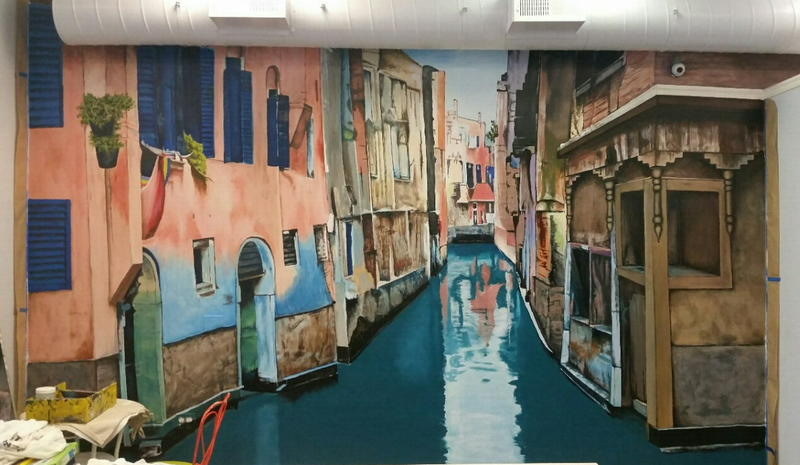 His latest mural is at a new restaurant, Buona Vita, 2114 Shattuck. Stefen’s art is not overtly political. 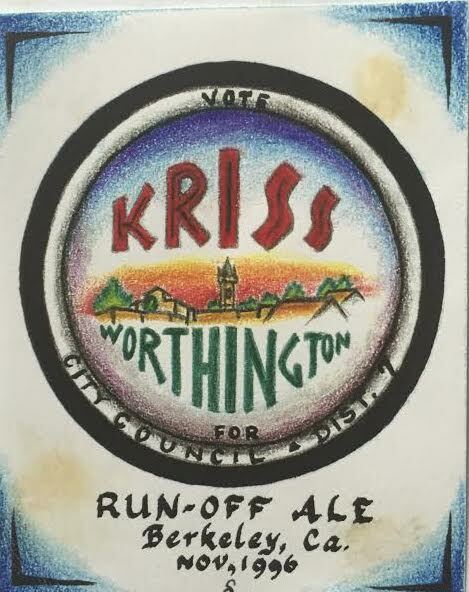 That said, Stefen designed an ale label and sign for Kriss Worthington, running for City Council District 7. 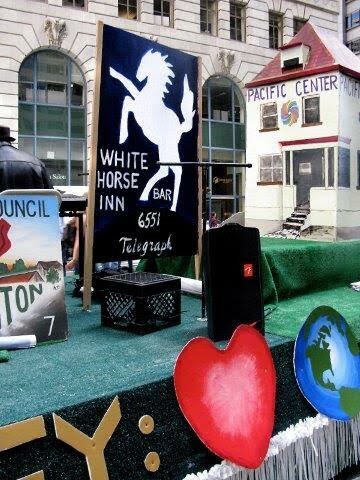 In 2012, Worthington led an effort to have a Berkeley float in the San Francisco Pride Celebration and Parade. Stefen painted most of the float. He sent me all the float and parade photos used above. 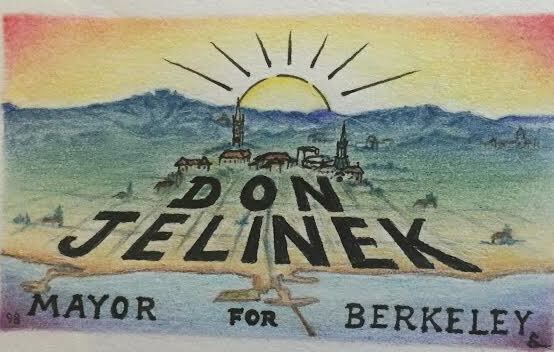 Don Jelenik was another Berkeley politician whom Stefen has supported with his art. 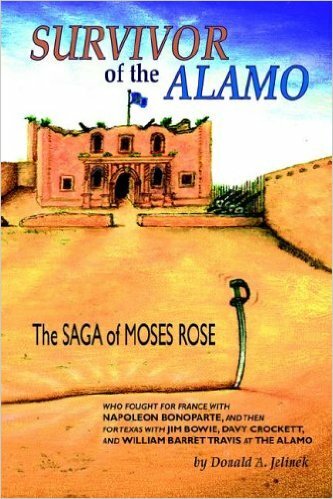 Stefen designed the book jacket for Jelinek’s book about Moses Rose. I’m not sure how the next two photos fit in, but these are two smaller pieces by Stefen. Stefen spent some time near Sutter’s Creek. 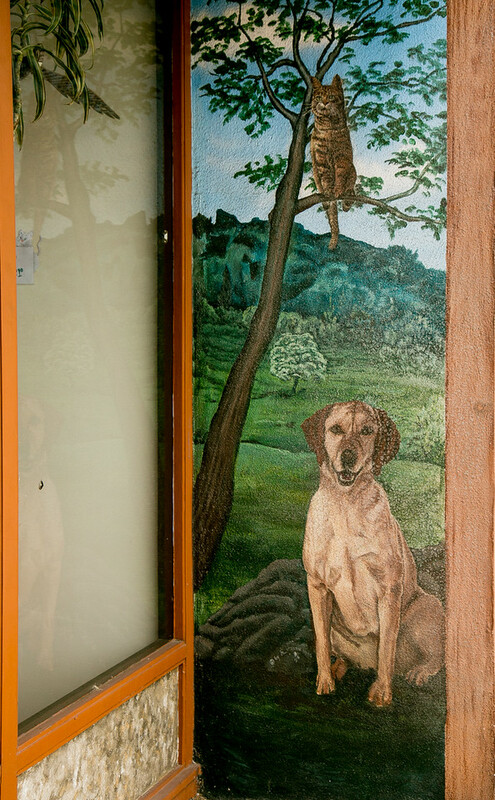 This painting is in Louise Berman’s home. 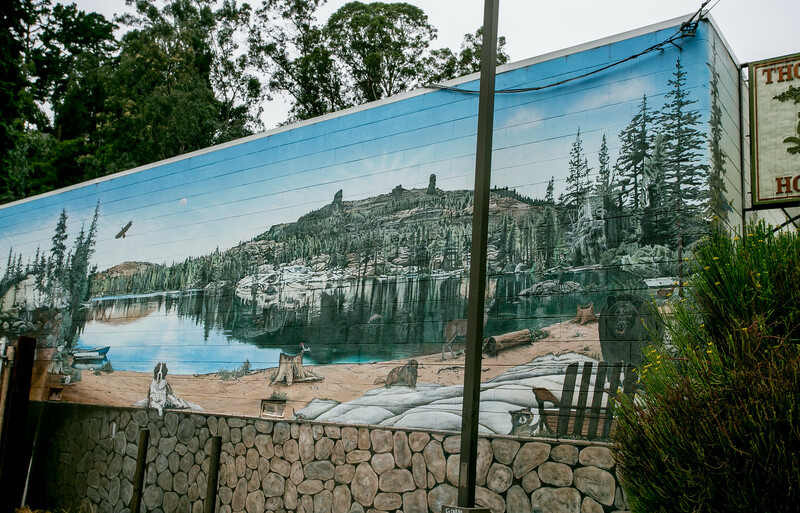 I will end with a few Stefen murals not in Berkeley. There are many, many, on his website, both existing and gone. These that I show below are existing, aren’t that far away, and really stand out for me. 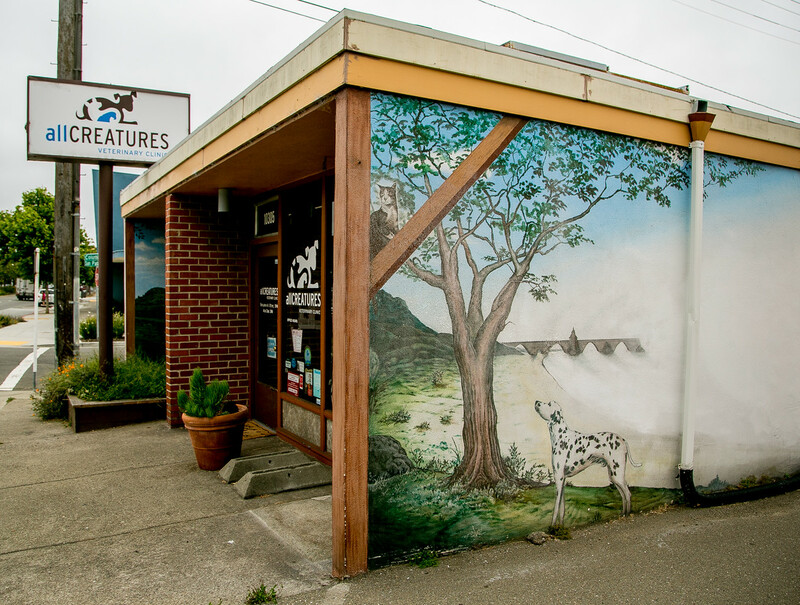 There are several Stefen murals at All Creatures vets at 10305 San Pablo, El Cerrito. They are aging, especially the south-facing wall. 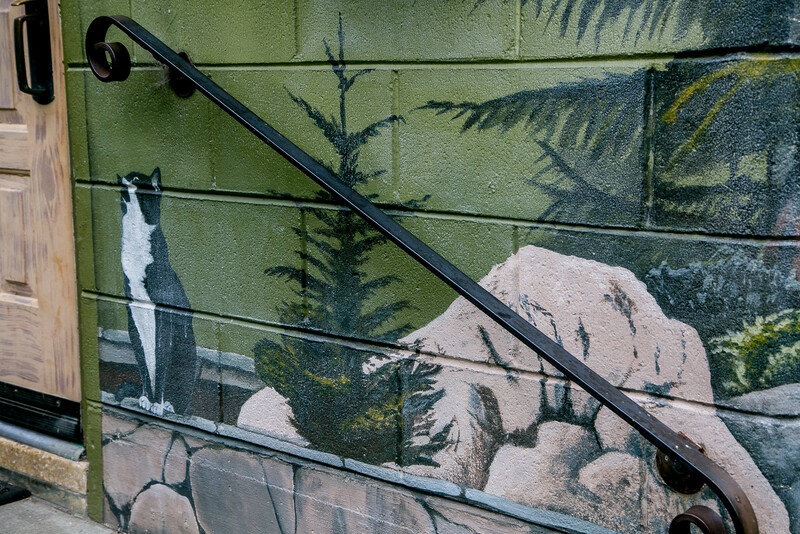 The murals were originally painted for Dr. Foor Paws in 1994. 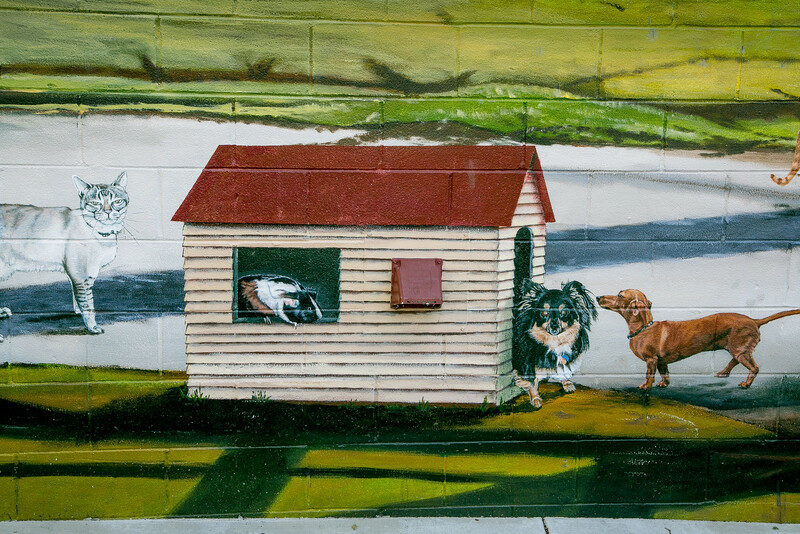 It was Stefen’s first vet mural project. 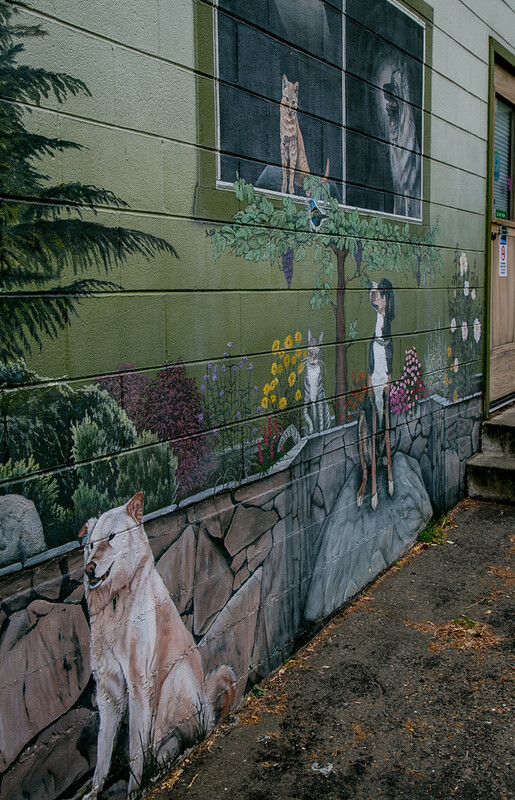 There are two Stefen megmurals at the Broadway Pet Hospital, 4920 Broadway, Oakland. 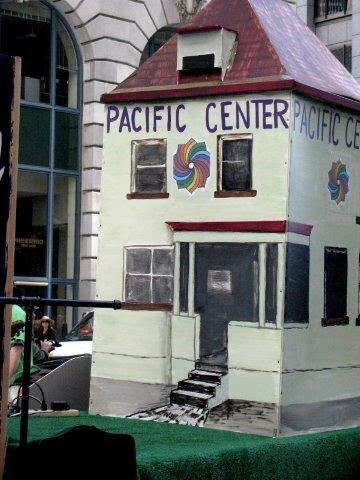 The Pleasant Valley/51st St. side (“Stroll at Lake Merritt”) was done in 2004. 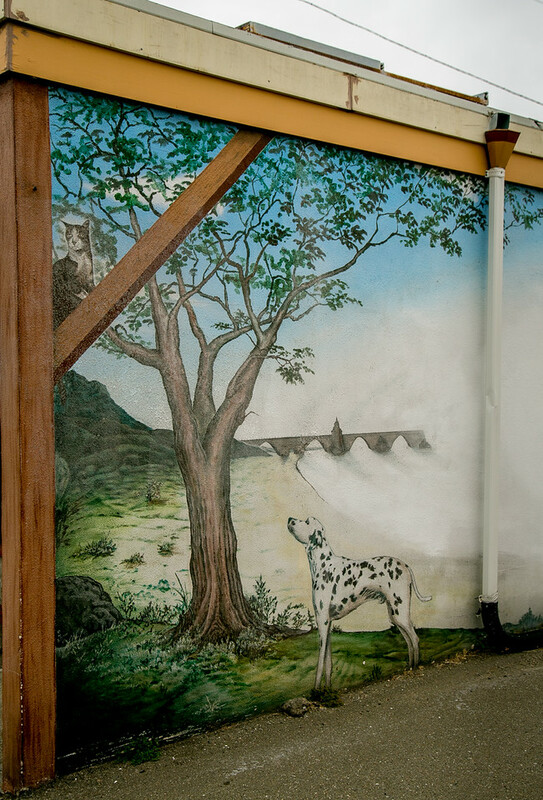 The Broadway entrance parking lot mural (“Rockridge Properties”) was done in 2008-2009. 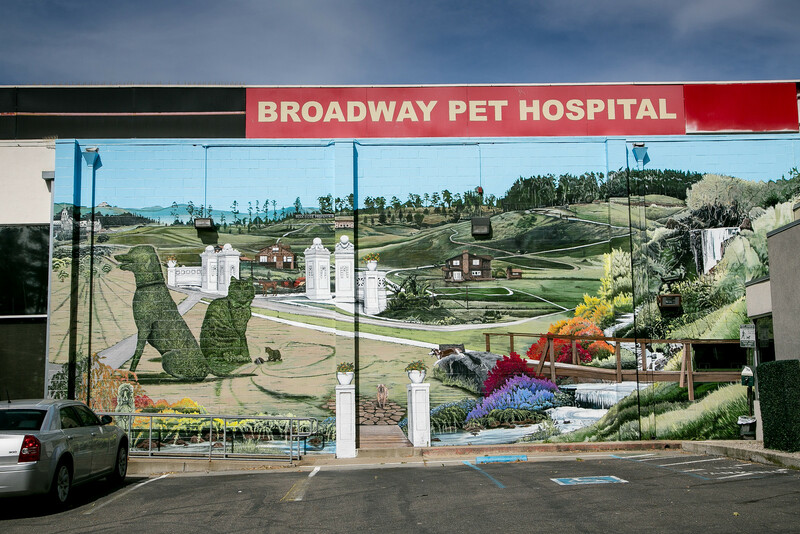 These are Stefen’s most recent pet hospital murals. 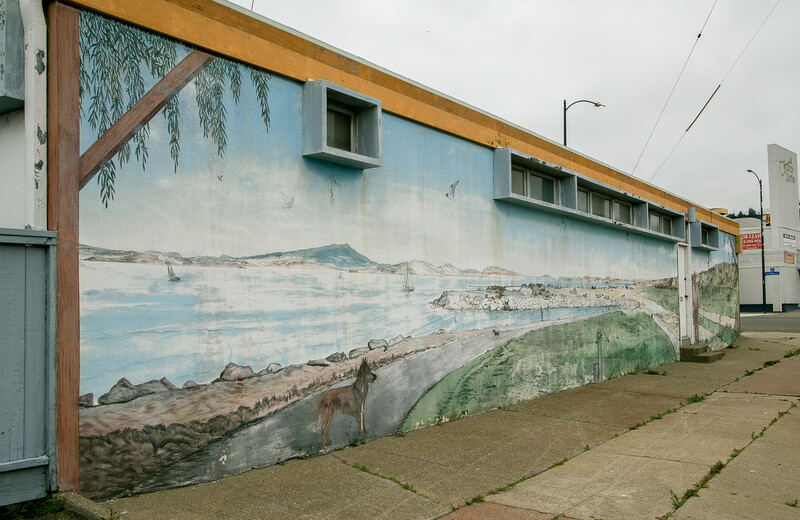 Wandering to Montclair – more Stefen vet murals. 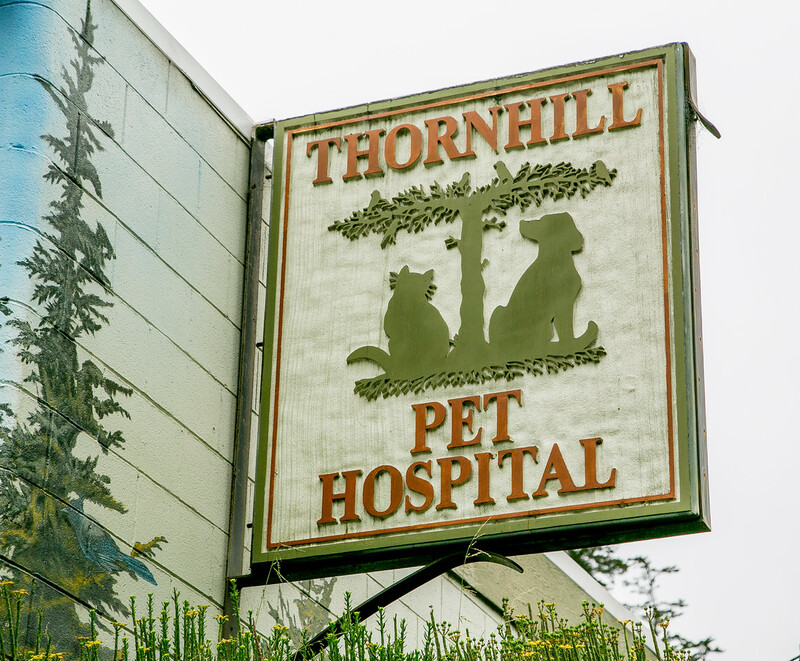 The Thornhill Pet Hospital at 5745 Thornhill Drive, Oakland, has Stefen art on four surfaces. 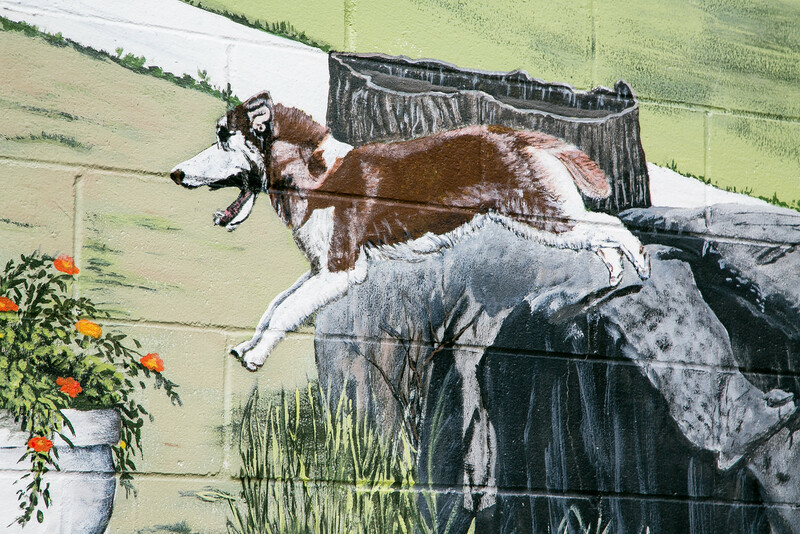 One of the dogs was modeled after an employee’s dog. The real dog barked when he saw it. Approval? Disapproval? Not known. But – enough vets. Let’s go to Alameda and see what we can see. 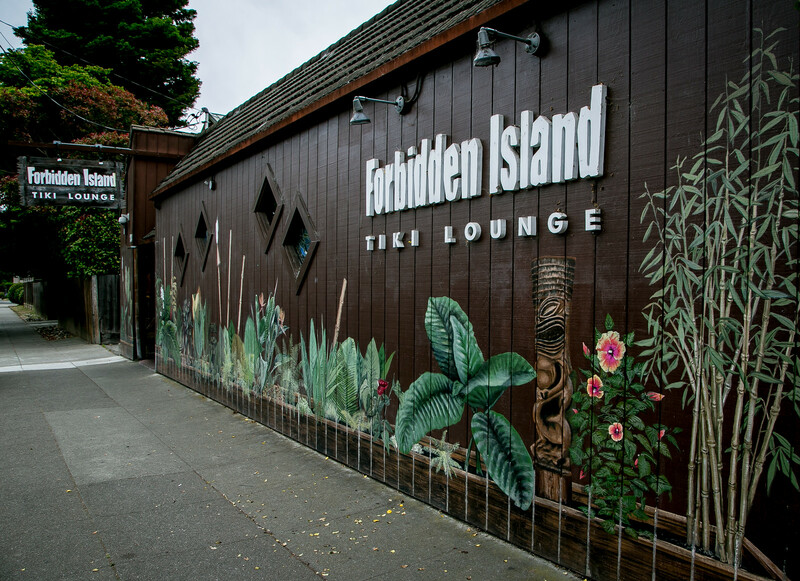 Forbidden Island at 1304 Lincoln Avenue, Alameda, is a Tiki joint. HUGE BONUS POINTS! 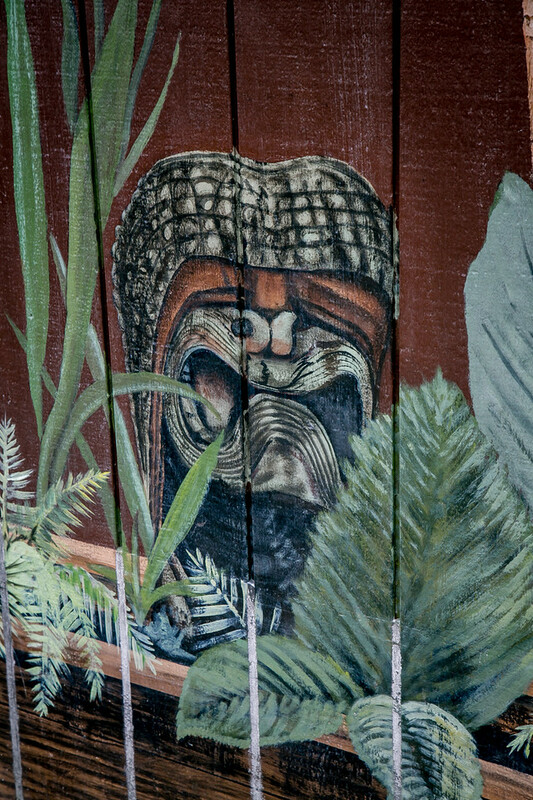 With plant-based mural by Stefen featuring two Tiki figures. Yes! I spent several afternoons talking with Stefen in his apartment. We met at Louise Berman’s. We met at Picante for dinner with his friend Richard Schwartz, Berkeley historian. If I had only one word to describe Stefen, it would be “dignified.” He is careful with words, articulate, thoughtful. And dignified. 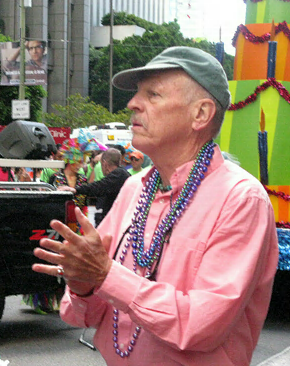 He is a quiet, passionate, modest-living citizen of Berkeley who takes his art, his life, and his citizenship in Berkeley seriously. 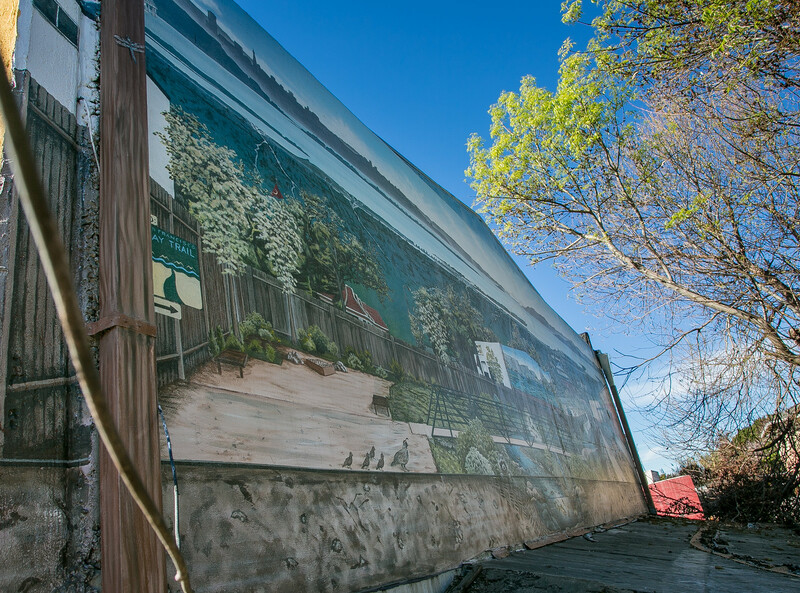 Stefen is in the planning stages for a big wrap-around mural on San Pablo, in Berkeley. I hope to document its creation. 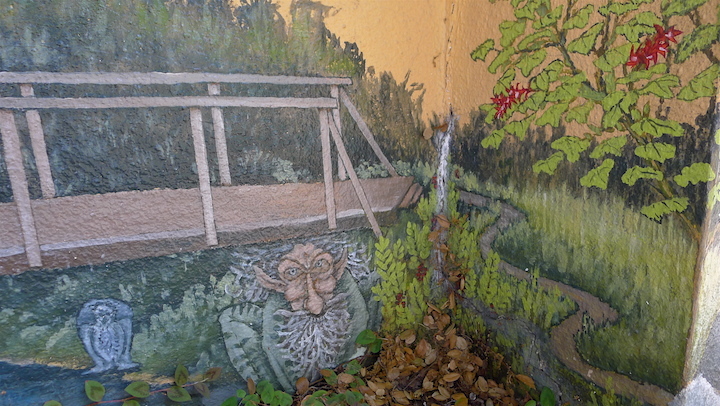 So far I have: (1) Stefen’s cartoon (yes, that is the name for a sketch or rendering of a mural) of the mural; and (2) photos of the walls as they stand today. Good start! 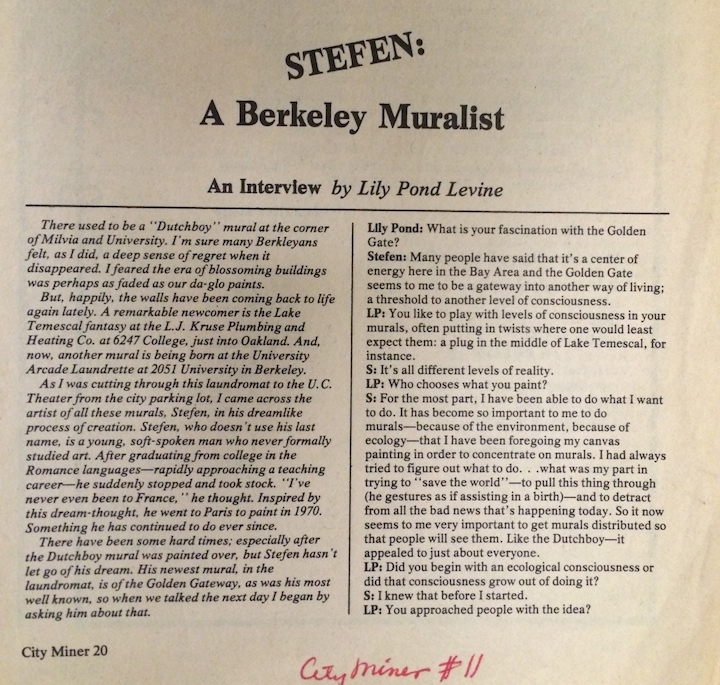 Stefen’s murals don’t fit the Berkeley Mural Mold – no hint of Diego Rivera. No hint of glorified proletariat or ethnic pride, our usual fare. I like the mold, but I also like Stefen’s work. I am not saying that there is not a message – there is a message. It is – Peace Train. Beautiful planet. Animals. Fit the mold or not, he was the first. When we say that somebody is important in a field, the secondary message is often “important but not so good.” There is no secondary message here. Stefen is important and Stefen is good. 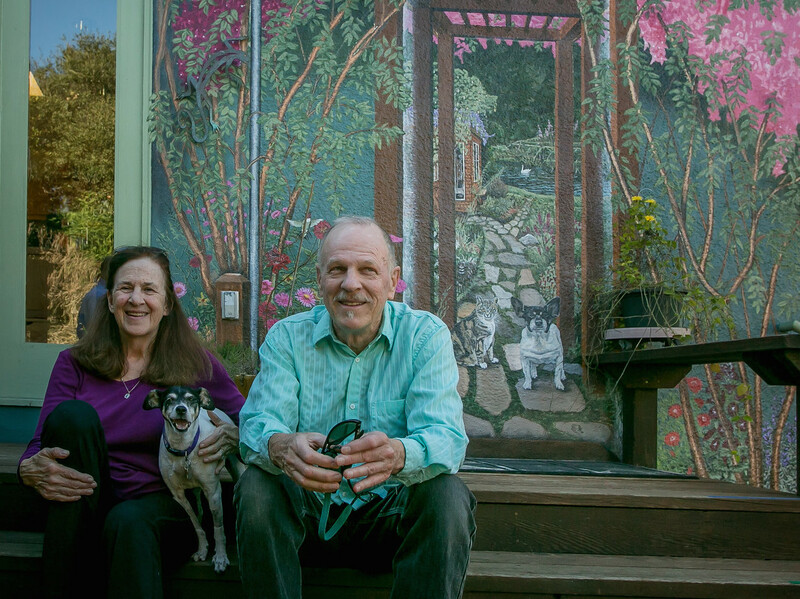 His murals have been in our lives for 40+ years now. And he is still planning and painting and giving joy and peace. What about the whole post, what about Stefen’s work? Stefen is indeed very creative. He has been my friend for 18 or so years but we grew up in the same small town, not meeting until we were adults and of course by serendipity! Stefen has fascinated me with his artwork, especially the surreal work from our hometown in Nevada. I am proud to call him my friend. I know one of his art teachers when he was very young and I know that if that teacher could see Stefen’s accomplishments today, he would be so proud of him. 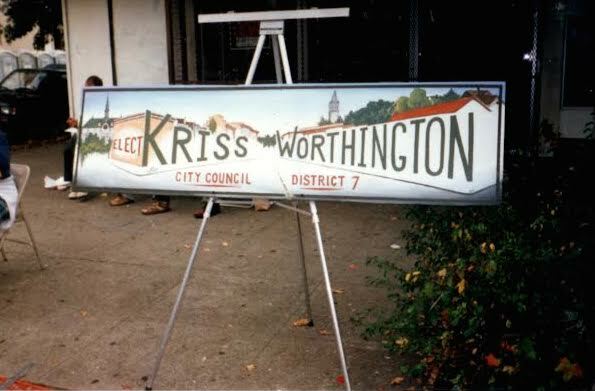 My dad worked for the City of Berkeley for 32 years, and we just saw a news story about murals in Sacramento. 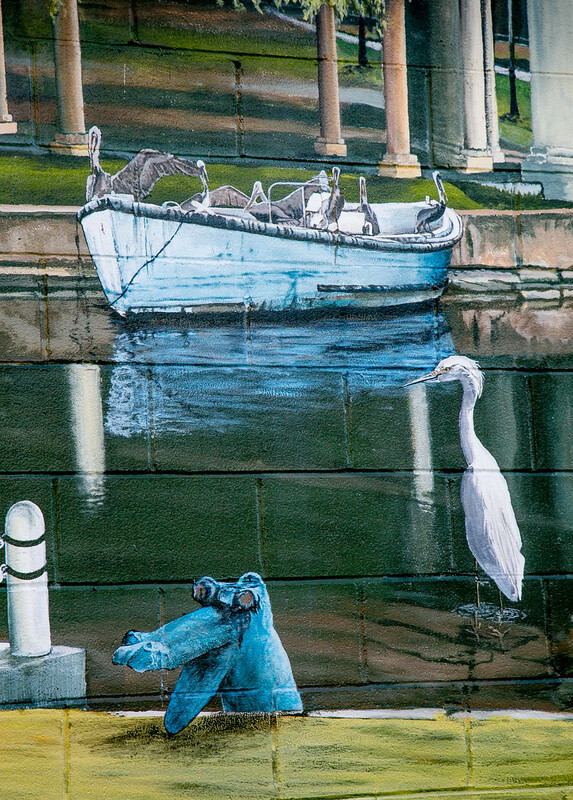 This reminded him of your Dutch Boy mural. He was so disappointed it was painted over. He feel in love with it and thinks it was so neat. And I am so happy I found a picture of the Dutch Boy online not only so he could see it again but so that my mom and I could enjoy it as well. 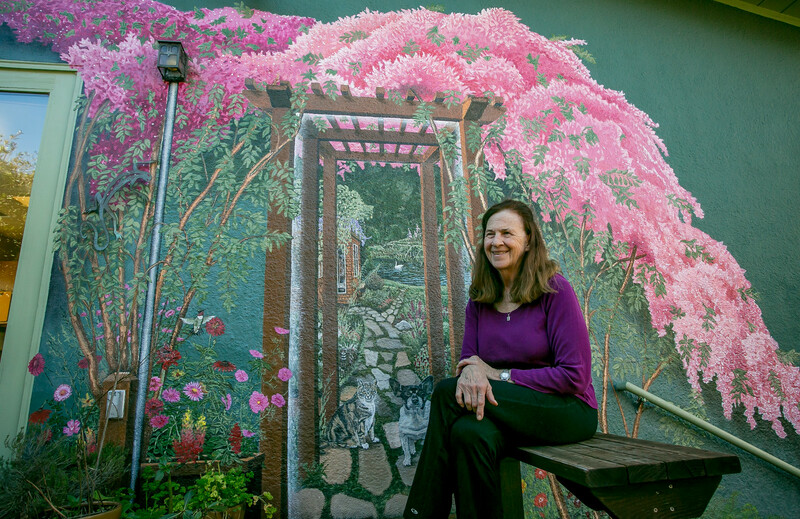 Thank you for sharing your artistic talents to the world especially in Berkeley. I worked with Stefen for years in the early days. What a delight to see this whole body of work listed here! 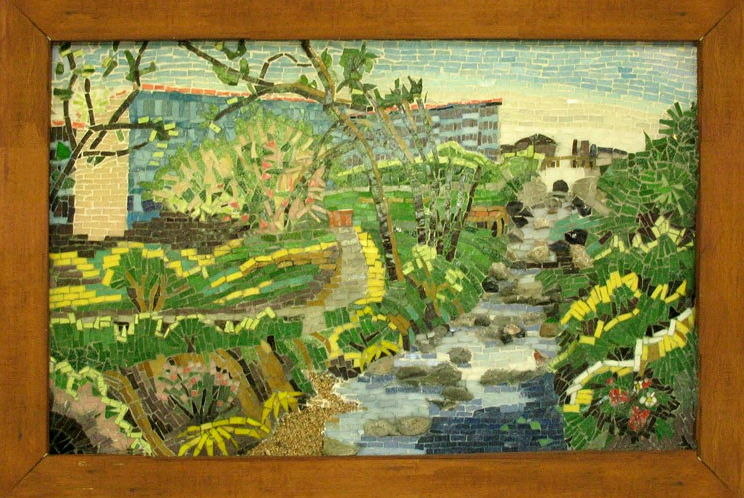 Strawberry Creek mosaic pictured above. It’s an ever-present joy in my life. Stefen is not only a highly talented artist, but a quiet, unassuming, generous person as well. 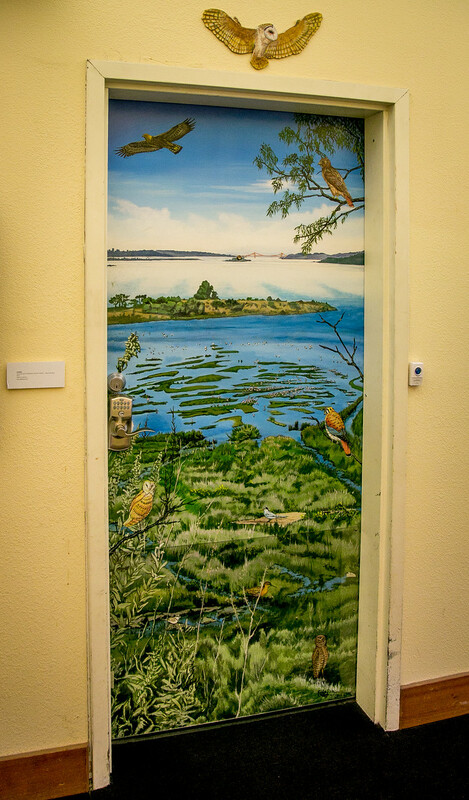 Thank you for this tribute to one of the Bay Area’s true artistic treasures. Wow! 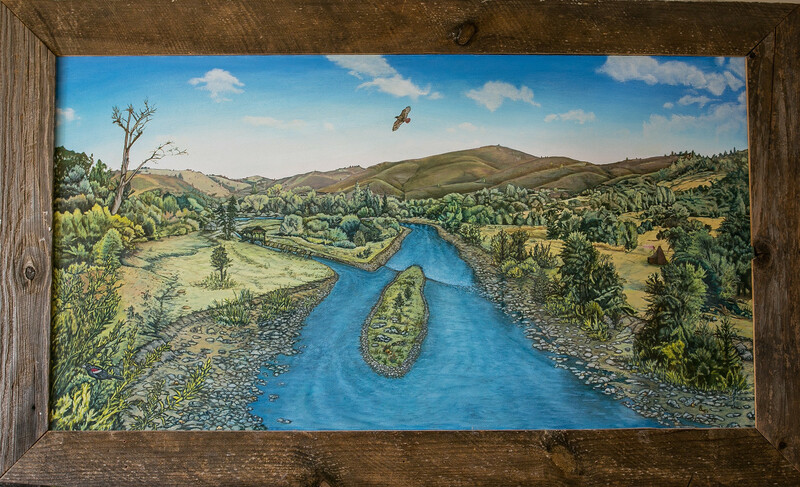 I have known Stefen for a few years through a community group and knew that he is a talented artist, but didn’t know about his murals — which are fantastic, thanks for publishing so many of them here! 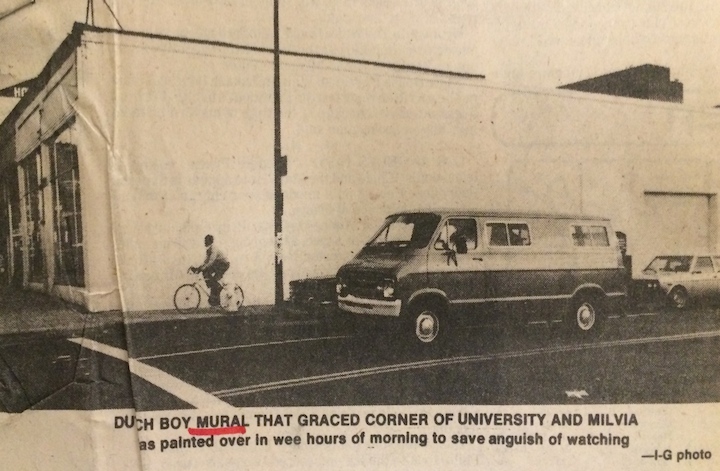 I grew up in Berkeley and remember the Dutch Boy mural fondly. So fascinating and so well executed! I didn’t know the story of its demise though, thanks for filling us in on that history. I have known Stefen for about 35 years! He is a treasured friend. I actually first spoke with him when he was doing the Dutch Boy Mural, and I was walking by, but we met again when he was doing a mural in Martinez where I was working. We have been friends ever since. I have watched him do some murals and have seen many of them but oh, my – not all of them! Thank you for the excellent write up which really does him justice, or begins to. 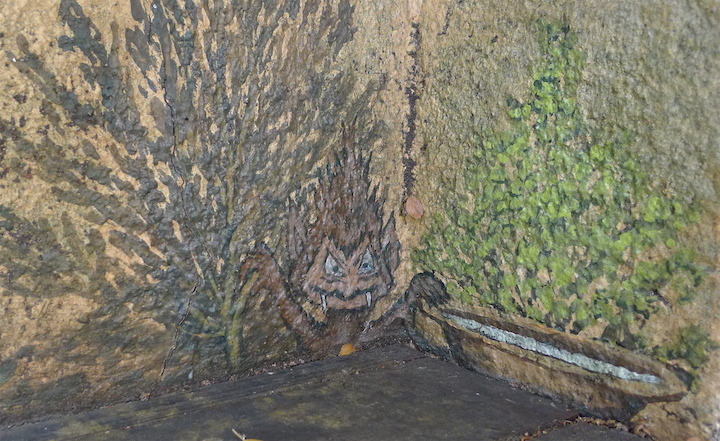 I also enjoyed the earlier Berkeley murals. 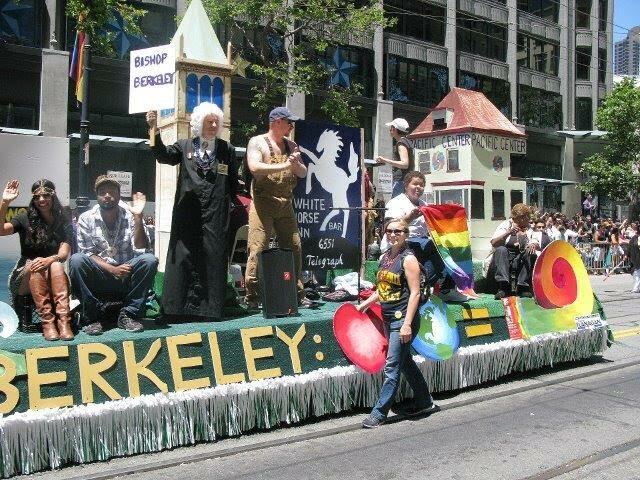 I grew up in Berkeley and remember seeing some of them when I was a child. Great!